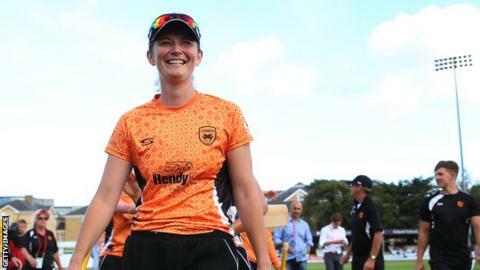 The women's Super League is set for an exciting finish at the Twenty20 competition's Finals Day at Hove on Friday, 1 September. Surrey Stars and Western Storm face each other in a semi-final in the first game of the day, with the winners playing holders Southern Vipers in the final. Following England Women's successful 50-over World Cup campaign, six head-to-head matches alongside the men's T20 Blast were showcased on television to make it the most-watched English women's domestic cricket tournament. BBC Sport looks at how each of the teams reached the tournament's grand finale in Sussex. Despite heading into the final group matches on Saturday, 26 August in second place, a brilliant all-round bowling display against Yorkshire Diamonds ensured the Vipers booked their place in the final. Charlotte Edwards' side clinched bonus-points victories in four of their games, winning by a net run-rate margin of 1.25 or greater. New Zealand opener Suzie Bates smashed an unbeaten 119 off 79 balls, to score the first century in Super League history, and Edwards complimented her side's collective effort this season. "It is a hard competition," the former England captain told BBC Sport. "You need to start well and we took pressure off ourselves by doing that. "I think it has been a real collective effort this year, with different people standing up. "Being directly in the final means the players will be fresh and focused on just the one game." After a disappointing first season, Surrey bounced back in style by winning their first four group games. The London side boast five international bowlers - including Nat Sciver, England spinners Alex Hartley and Laura Marsh, South Africa fast bowler Marizanne Kapp and Australia seamer Rene Farrell. Despite a comprehensive loss in their final group match to Loughborough Lightning, Stars' captain Sciver praised her side's development over the past year. "The biggest thing that has changed since last season is there has been a bit more awareness of the game from the girls," said the all-rounder. "You don't have to scratch around to see who can go in the best position and the girls' fielding has really improved." Last year's runners-up struggled to get into their groove in the early part of the Super League, before Rachel Priest's sensational innings in York sparked their campaign into life. The New Zealand wicketkeeper's century took Storm to a 10-wicket win as they chased down 161 in just 17 overs. Captain Heather Knight is hopeful the lessons learnt from coming up short in last year's final will stand them in good stead on Friday. "We're only focusing on the semi-final right now," explained Knight. "That's what we did last year. "We were a little bit tired in that second match, so we've been working on switching on quickly after breaks. "If we get to the final, it will be a game under light, which is new to a lot of the girls. We've been out practising the past couple of nights at Exeter University, just in case."